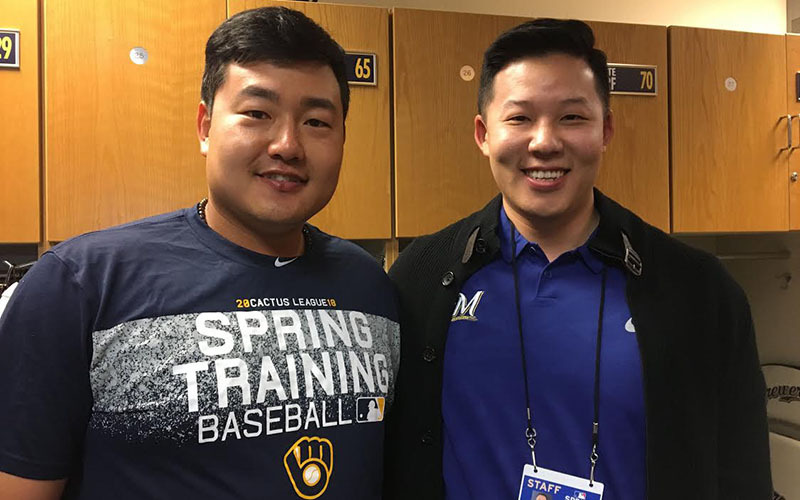 PHOENIX — Brewers first baseman Ji-Man Choi isn’t the only person in Milwaukee’s clubhouse who speaks fluent Korean. However, the first time he encountered the one other person who does — his translator, Daniel Cho — it wasn’t without some uneasiness. “It was super awkward,” Choi said through Cho on Wednesday, prompting both to burst into laughter. “It’s still awkward,” Choi said again through Cho, the two roaring into laughter once more. Prior to meeting about 20 days ago, the two had never spoken before. Cho was only familiar with Choi because of the latter’s past stints with the Yankees and Angels. Beyond their awkward greeting, the two 26-year-olds have built up a good rapport. Interpreters are not uncommon in Major League Baseball. In 2016, the league announced it expected each team to hire a professional to assist with Spanish-to-English interpretation. In 2017, 31.9 percent of players were Latino. Additional interpreters are at a team’s discretion. Last season, Asian players made up 1.9 percent of the league, according to MLB. Choi had agreed to a minor league contract with the Brewers over a month before spring training began, a deal that included an invitation to their camp. At the outset of spring training, Choi, a native South Korean, was virtually unavailable for interview with media since he spoke hardly any English. It wasn’t until Cho arrived some 20 days ago that that changed. The arrangement came about fortuitously. Cho already had been hired by Milwaukee’s Triple-A affiliate, Colorado Springs, to serve as a digital-video intern. The Brewers approached him about simultaneously serving as Choi’s translator, since both clubs make use of Maryvale Baseball Park in the spring. In high school, Cho was a pitcher and middle infielder. He played professionally with Yonsei University in Seoul, South Korea, for about a year. An injury prevented him from ever officially taking the field in a game, however. Cho returned stateside and attended UC San Diego, where he earned a bachelor’s degree in communications. Cho sent some international scouting reports to the Brewers. It left a good impression, and they offered him a gig as a video intern with the Sky Sox. Choi’s signing has provided Cho an opportunity with the big-league club. Cho’s day starts early in the morning, mixing and cutting video at the minor league facility, before getting to the Brewers clubhouse by 8 a.m., when media availability begins, to serve as a translator to reporters and teammates. He hangs around the clubhouse through availability, in case media wants to speak with Choi. After that, he heads back to the minor league facility, but stays on-call for whenever Choi needs him. His effort has been greatly appreciated by Choi, who credited Cho for helping him assimilate and subsequently enjoy some of his recent success. In the spring, hustling over from one side of a complex to another is doable. When the Brewers and Sky Sox go their separate paths, however, it won’t be so simple. The Brewers kept Choi on their 40-man roster, and could potentially keep him on the major league roster into the season. Cho, meanwhile, is scheduled to go to Colorado Springs when the Sky Sox begin their season. Cho would have to travel more than 1,000 miles to go from Milwaukee to Colorado Springs. So what happens then? Until that decision comes, Cho is enjoying his job. He finds the chance to work around major league players fun and exciting, in addition to cutting video and making scouting reports.